The effectiveness of T-STRIPE in preventing condensation has already been proven by two independent entities; the Austrian Institute for Healthy and Ecological Building (IBO) and the certified expert and graduate engineer Günther Apfelbacher. While studying the heat bridge effect with an outdoor temperature of minus twelve degrees (-12°) centigrade the following results could be observed: Without T-STRIPE the lowest measured temperatures on the inside surface of the window pane were seven (7°) degrees along the edges of the pane. With T-STRIPE the lowest recorded temperature on the glass surface was sixteen (16°) degrees in the middle of the window pane. During these tests the T-STRIPE heating element itself reached a temperature of 38.9 degrees. 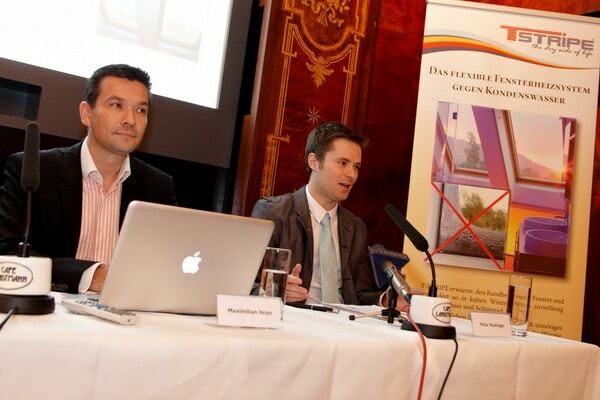 Maximilan Hron (left), inventor and managing director of T-STRIPE und Felix Heisinger of the IBO, author of the study, at a press conference presenting the study’s results. The study also unveiled another positive side effect of T-STRIPE. By heating up the window pane along the edges the resulting warm air circulation raises the temperature of the window as a whole. Most of this heat radiates back into the room, raising room temperature and therefore indoor environment quality as well. Up to 63.2% of invested thermal energy is being reflected back into the room. Often times people who have problems with condensation on their windows are being advised to simply air their rooms more often and to turn up their radiators. Compared to these methods T-STRIPE offers several advantages. By increasing the airflow within a room excessive humidity could be reduced and an increase in comfort can be achieved as well – as long as certain temperatures are not being exceeded – but condensation water can never be fully avoided. Additional heating expenses also depend on what heating system is being used. All of these methods do not reduce the likelyhood of condensation to occur. Only with T-STRIPE condensation water becomes a thing of the past, the heat dissipation effect adds to a comfortable room climate. „…it should be considered that – especially with regards to availability on the market – the T-STRIPE system marks an unprecedented contribution on the subject of condensation and mold spore prevention in conjunction with window constructions and exterior walls. Over the years I spent finding a solution for my problems with condensation water, I met a lot of people who were equally frustrated. After coming up with invention I decided to introduce it onto the market.’ says T-STRIPE inventor and engineer Maximilian Hron. ‘Since I always wanted to provide my customers with a satisfaction guarantee, I made various experts conduct studies on T-STRIPE.